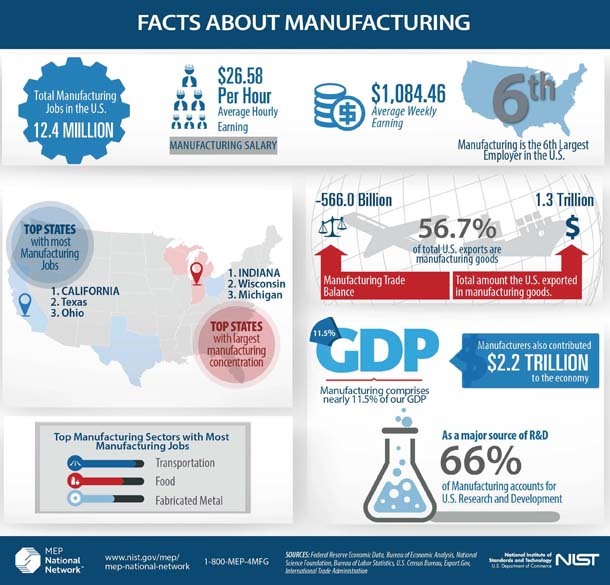 The Facts about Manufacturing infographic contains industry, workforce, and manufacturing data and statistics showing the critical role that manufacturing plays in the U.S. economy. Infographic courtesy of MEP National Network, NIST. A new era brings complex challenges for the nation’s manufacturers, including small and medium-sized companies. But if past is prologue, the NIST’s Manufacturing Extension Partnership will stand ready to help negotiate the twists and turns of a changing industrial landscape. The coming decade offers a host of challenges and opportunities for both large and small manufacturers alike, and forging the right partnerships — whether public, private, or both — is key to navigating the coming changes. Your local NIST Manufacturing Extension Partnership (MEP) Center can be a key partner in helping you build the right relationships. I was reminded of this recently while reviewing last year’s report by the McKinsey Global Institute, the business and economics research arm of McKinsey & Company, the worldwide management consulting firm, entitled “Making it in America: Revitalizing U.S. Manufacturing.” The report explained why the erosion of U.S. manufacturing isn’t a foregone conclusion, and how changes over the next decade could open up new opportunities to reverse the recent industry setbacks. McKinsey forecasts that U.S. manufacturing could boost annual manufacturing value added by up to $530 billion (20 percent) over current trends by 2025 — that is, if the manufacturing sector is prepared to capitalize on the coming changes, such as advances in manufacturing technology. “Given the importance of manufacturing to the broader economy, capturing these opportunities should be a national priority,” the report stated. While these changes will affect every part of the U.S. manufacturing industry, smaller manufacturers will face somewhat different opportunities and challenges over the next decade from larger companies. Let’s look at some reasons why. Demand is soaring, and economies are improving both in the U.S. and abroad. As the report points out, the U.S. is still one of the most lucrative markets in the world. The diverse, technologically savvy consumers here expect quality, low prices, and variety from their products. This demand is driving increases in certain consumer sectors, such as food processing, and is evident as one manufacturer reported that the SKU count of its North American business unit rose by 66 percent in just three years. However, this increase in U.S. consumer demand may not be felt by all U.S. manufacturers, especially smaller ones that are regionally focused. Because income growth has increased unevenly across different U.S. regions, growth and demand may spike in certain areas while stagnating (or even declining) in others. Looking beyond U.S. borders, emerging global markets such as Africa, Brazil, China, and India present an enormous potential for growth. However, consumers in these markets — and even within the same country — exhibit high regional, ethnic, linguistic, and income diversity, which means that competing in these markets is a very complex undertaking. The ExporTech program, jointly offered by the NIST MEP and the U.S. Commercial Service of the U.S. Department of Commerce, was created to help small and medium-sized manufacturers (SMMs) navigate these nuances and increase their exports to these emerging global markets. The program helps manufacturers build relationships by providing introductions to new clients, and by deepening relationships with existing clients. As “Industry 4.0” takes over, advanced manufacturing will become the rule, and not the exception. As defined in the McKinsey report, “Industry 4.0” refers to the convergence of multiple technological changes: the increasing volume of available data, machine learning developments, new forms of human–machine interaction (such as touch interfaces), and the ability to translate digital instructions into a physical product. This convergence is increasingly becoming the standard, and even smaller manufacturers will need to implement these technologies to increase productivity and become more competitive. Smart manufacturing is one of the most immediate Industry 4.0 trends that affects manufacturers and refers to integrating information technologies with operating technologies. This definition encompasses many manufacturing applications, such as computer-assisted design software or monitoring machines remotely via computers or tablets. Robots fall under the broad umbrella of smart manufacturing, and while they can be a significant upfront commitment (cost- and training-wise), over time, they represent an excellent opportunity to either achieve automated, cost-efficient, large-volume operations, or pursue highly customizable production capabilities. If you want to implement advanced manufacturing techniques and technologies in your facility, but aren’t sure where to start, there are resources tailored to SMMs. For example, MEP Centers have staff members at all 14 Manufacturing USA Institutes, which work to transfer promising, early-stage technological advancements to operational manufacturers to provide resources for growing their business and establishing their place in the emerging Industry 4.0 landscape. The relationships being built at these centers are key to bridging the gap between early, pre-competitive research and the factory floor. If they want to compete both stateside and abroad, large corporations will need to focus not just on cost cutting during the procurement process, but also on building value — and this won’t always happen with large manufacturers. As an example, the report notes that in the auto industry, inefficiencies in OEM–supplier interactions can add up to 5 percent of development, tooling, and product costs. The auto industry is far from the only one affected by such inefficiencies, which will likely only grow as manufacturers decrease turnaround times and increase product portfolios. And while OEMs begin to reach out to the smaller members of their supply chains, SMMs need to focus on modernization and expanding their access to advanced manufacturing technology. Connecting with a partner such as the MEP National Network™ can provide smaller manufacturers the financial, technical, and business expertise they need to compete at a higher level and work successfully with much larger manufacturers and corporations. To address the upcoming challenges and take advantage of potential opportunities, a company’s success truly depends on forging the right partnerships, and MEP is here to help. If you’re looking for help exporting to emerging markets, implementing advanced manufacturing technologies, or optimizing supply chain relationships, connect with your local MEP Center for more information and advice. Steve Campbell is an economist in the Manufacturing Research and Program Evaluation group with the Manufacturing Extension Partnership (MEP) program at the National Institute of Standards and Technology (NIST). Prior to this position, Steve served as an economist in NIST’s Technology Partnership Office, the Advanced Technology Program (ATP), where he also served as the senior advisor to the Director of the program, and the Technology Innovation Program (TIP), where he served as the Group Leader for the Impact Analysis Group. The date August 23, 2018 represents a milestone in the Hollings Manufacturing Extension Partnership (MEP) program at the National Institute of Standards and Technology. Thirty years ago, on this date in 1988, President Ronald Reagan signed the Omnibus Trade and Competitiveness Act (Public Law 100-418). Section 5121 established the Regional Centers for the Transfer of Manufacturing Technology and the Assistance to State Technology Programs, the precursors to today’s MEP. Looking back, the history of MEP is truly the history of the manufacturing sector. Over the years, MEP’s network of Centers and selection of service offerings has evolved to address the challenges of small and medium-sized manufacturers (SMMs), who make up 99 percent of the manufacturers, ever advancing U.S. manufacturing. Since 1988, MEP has worked with 94,033 manufacturers, leading to $111.3 billion in sales and $18.8 billion in cost savings, and helping its clients create and retain 985,317 jobs, based on data collected since 1998. Here are what I like to think of as the four “eras” of the last 30 years in MEP — and manufacturing — history. While the legislation established the Regional Centers in 1988, they didn’t start serving clients until 1989. The first three were the Northeast Manufacturing Technology Center in New York, the Southeast Manufacturing Technology Center in South Carolina (home state of Senator Ernest “Fritz” Hollings, champion of the program for whom the Hollings Manufacturing Extension Partnership is named), and the Great Lakes Manufacturing Technology Center in Ohio. The Manufacturing Technology Centers (MTCs) were modeled on technology extension services, such as the Kohsetsushi Centers in Japan, the Fraunhofer-Gesellschaft Institutes and Steinbeis Centers in Germany, and the Industrial Research Assistance Program in Canada. They had a mission to support the transfer of manufacturing technology to improve the productivity and technological capabilities of America’s small manufacturers, based on NIST’s Shop of the 90s program in what was then the NIST Manufacturing Engineering Laboratory (now part of the NIST Engineering Laboratory). The inaugural program was a success, and four more MTCs were created by 1992: The Midwest Manufacturing Technology Center in Michigan, the Mid-America Manufacturing Technology Center in Kansas, the Upper Midwest Manufacturing Technology Center in Minnesota, and the California Manufacturing Technology Center. By 1996, thanks to additional federal funding, a partnership with the Department of Defense, and a merger with the State Technology Extension Program (STEP), what started as the regional MTC program went national and was re-christened the “Manufacturing Extension Partnership” (MEP). With 60 MEP Centers covering all 50 states and Puerto Rico — and nearly a decade of information from the field about the challenges facing manufacturers — MEP set out to devise national service offerings that could assist U.S. manufacturers and increase the competitiveness of U.S. manufacturing. What MEP’s work in the field had revealed was that emerging technology wasn’t necessarily the answer to all issues facing U.S. manufacturers. Quite the contrary, most manufacturers across the country needed “point solutions” to address immediate needs — particularly when it came to improving efficiency and meeting increasingly rigorous industry quality standards. The Manufacturing Extension Partnership’s first concerted effort at continuous improvement was its Lean 101 program, which was designed to introduce SMMs to lean concepts through both training and simulation. Nearly all MEP Centers adopted some version of Lean 101 and tens of thousands of manufacturers have been trained in lean by MEP Centers using the core principles. This foundation also provided the basis for the development of other lean enterprise products and services, including value stream mapping, setup reduction, cellular manufacturing, kanban, and Total Productive Maintenance (TPM). At the same time, MEP also developed programs to guide manufacturers through the process of acquiring certifications in various quality standards, including general standards in the ISO 9000 series, the environmental management–focused ISO:14000, and more specialized industry-focused standards, such as AS9000 and QS-9000. With the nationwide success of its lean and quality programs, MEP started looking at the U.S. manufacturing sector and considering where MEP, as a national organization, could provide more holistic solutions to manufacturers across the country. Consistently, feedback from the field indicated that U.S. manufacturers needed assistance with longer-term value creation, including growth strategies, product and process development, and supply chain optimization, as well as more focused efforts at technology acceleration and commercialization that could deliver attributable returns on investment. The MEP responded with programs such as ExporTech™, which helps SMMs and smaller technology companies expand into global markets; Innovation Engineering, an attempt to create systematic processes around innovation that lead to new products and processes; and technology acceleration services such as Technology-Driven Market Intelligence, which is a systematic approach to technology-focused market intelligence and Technology Scouting, which identifies the benefits and the market impacts related to a company’s technology-based asset (an idea, product, process, or capability). Over the past few years, MEP has fostered integration between NIST MEP, MEP Centers, and other representatives of what is today known as the MEP National Network™. As the years have gone by, we’ve come to recognize that experts at Centers and other participating organizations within the Network have developed specialized knowledge that needs to be shared with the rest of the National Network. Today, leadership within the Network springs from experts in designated practice areas that collaborate through a variety of means, including focused working groups, as well as national meetings and summits, rather than solely from the NIST MEP program office in Gaithersburg, Maryland. On many fronts, today the emphasis within the Network is again on technology transfer, dissemination, and commercialization. As manufacturers of all sizes prepare for Manufacturing 4.0, MEP is developing knowledge, leadership, and services in areas that are crucial to all manufacturers preparing to make the leap, such as cybersecurity, smart manufacturing, and the education of workers preparing to manage these emerging practice areas. If an impending sector-level development is poised to make a significant impact on manufacturing, some part of the MEP National Network is involved and is working to make expertise in that area available to the other 1,300 plus representatives who make up the Network. That level of expertise and willingness to share is what makes the Network “the go-to experts for advancing U.S. manufacturing,” now and for the foreseeable future. Dave Cranmer is the Deputy Director of the Hollings Manufacturing Extension Partnership (MEP) at the National Institute of Standards and Technology (NIST). With MEP since 1993, he has overseen extension centers and conducted research on innovation, new product and service development and deployment, supply chains, technology road mapping, eBusiness, and exporting. In addition, Dave has built a business-to-business marketing consulting practice for smaller manufacturers and has established specialty consulting practices in financial access, eBusiness, technology scouting, and technology-driven market intelligence (TDMI). He has also worked on the formation of technology collaboratives using TDMI and a set of business-to-business network pilot projects for the MEP System. He is the current government representative on the U.S. Food and Drug Administration’s Devices Good Manufacturing Practice Advisory Committee. Today, NIST measurements support the smallest of technologies to the largest and most complex of human-made creations—from nanoscale devices so tiny that tens of thousands can fit on the end of a single human hair, up to earthquake-resistant skyscrapers and global communication networks.